“You’re only one run away from a good run.” That’s Gomer1’s theory, and Gomer2 hopes it’s true, because it was brutal for him this week. But it makes for good podcast material, right? Join the guys as they process what it means when one of them has a good week and the other, well, DOESN’T. Of course, it’s not all doom and gloom. When it gets that way, all the guys have to do is argue about whether or not Avatar is actually any good, and everything gets back to normal. 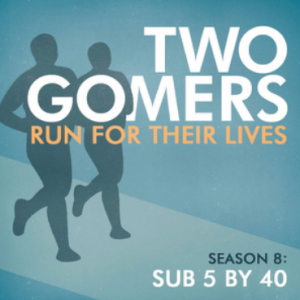 Plus, the Gomers reveal their initial thoughts and plans for Running for a Cause in the Runner’s Corner, get back to their jazz roots in Songs to Run To, and talk cold weather and cold leftovers in Listener Feedback. Happy Running! Monday Survey this week: Do you have any experience with Running for a Cause? Any advice for us? Did it make your running more worthwhile? Tell us your story! Gomer2 – Couldn’t help but hear the frustration in your voice as you talked about your long run, your time and the time it takes away from family. Adversity training will work to your advantage in the long run (pun intended). Bad runs just happen. But make sure you fuel your body properly for all long runs. And the right music may make the difference for mile 8. You want something that will pump you through it. I hate mile 8. Hang in there. Ice your knee. You guys are funny. I am 56 and you guys make me laugh. I can definitely relate to Gomer1’s worship moments. I do the same thing. Hey, the Gomers got a shout out on a Runners World forum today! You had it DEAD ON with Avatar. The movie TOTALLY blew. The graphics were OUTSTANDING, but the plot…Well, . . . Kelly and Justin had a thicker plot. Sweet! I’ve been lazy and am just now catching up on the past couple month’s episodes, but I’m glad to hear my husband’s “lay down day” made the podcast. Off to listen some more!